The first Biennale Round table conference held on 11th January 2019 at Alliance franchise Karachi, views “Displacement and social ecology” in a multi-dimensional perspective. Shahana Rajani; an artist and a researcher, Aquila Ismail; an activist and a writer, Gul Hassan Kallamati; a historian and Naziha Ali, a journalist; all four speakers shared a common concern for the underlying violence faced by indigenous communities due to the developmental projects in Karachi. These projects tend to abandon masses of people from their homes living within the metropolis and its outskirts. 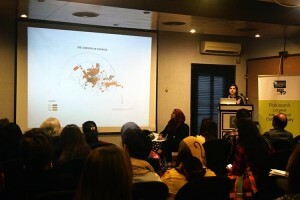 Shahana Rajani demonstrated the growth of Karachi’s settlements with the use of mapping to highlight the exclusionary nature of the pre-existing geography. According to Rajani, the institutional opacity of indigenous communities is not as grave an issue, as much is their complete erasure from the country’s historical narrative. To support this, she narrated an incident of communal violence on the Sikh community which in comparison to the past communal riots of other dominant ethnic groups; was completely eradicated. According to her research, the institutionalized existence of some dominant ethnic groups, in itself makes the very concept of a ‘nation’, questionable. For instance, the background story of of Quaid-e-Azam’s Mausoleum clearly indicates the strategic evacuation of Quaid Abad settlement during General Ayub Khan’s tenure. Furthermore, her research on the Gadap area revealed that it is not an entirely barren land which needed a major developmental transformation. Instead, it was a green zone with plenty of necessary resources available. However, the developers seem to inaccurately portray the before and after condition of the area via misleading pictures for their own commercial purposes. Similarly, Google maps mimic the state’s perception of the very settlement by illustrating it as opaque. The artist emphasizes further on the counter-visuality of the geography of Karachi. Whereas, Aquila Ismail shared a rather personal account over the issue in discussion and stated that in 1971, when East and West Pakistan had split apart as separate nations, Ismail was forced to leave her home town (Dhaka) to move to Orangi in Karachi, hence West Pakistan. The force driven departure from her homeland since childhood, infused in her a deep sense of loss, which she termed as “dispossession.” After the creation of Bangladesh, migrants to West Pakistan, settled at Orangi town area lived in Jhuggis and slums and were deprived of their most basic of needs; shelter, sanitation system, medical facilities and schools until 1980 when the OPP ( Orangi Pilot project) started which was founded by Akhtar Hameed Khan and run under direction of Parveen Rehman ( sister of Ismail) who fought continuously for rights of the recent settlers of Orangi town. Dr.Gul Hasssan Kallamati, takes the discussion further ahead by raising questions on the authenticity of numerous indigenous villages on the outskirts of Karachi which he believes have not been surveyed and recorded on the maps. He states that some of these settlements are rather planted by some political parties for their personal motives and measured political success until election season. The residents of these villages, after eviction, are offered homes by housing authorities, which they most likely refuse to accept as they lose their primitive ways of earning bread and butter from their agricultural activities and simpler lifestyles. Later, Dr.Kallamati talked about his book regarding the historical background and the development of the Malir Cant area that we see today. Further, he shared the story of Lasi Goth, a village situated on the outskirts of Karachi whose people have been engaged in criminal activities due to deprivation of basic needs and resources. Another major problem that Kallamati sheds light over is the water crisis , that immensely rose due to growing number of developmental housing schemes. Such issues need to be taken into serious consideration; and effective strategic measures need to adopted and applied by the new government, he concluded. Naziha Ali, found her research divert toward the topic of Bahria town Karachi after having studied the Parveen Rehman’s Murder. According to her, the major hurdle during this investigative research was that the name ‘Bahria town’ in itself was forbidden in the field of media where most people would generally prefer to avoid it. She added, that the construction of developmental projects and the resulting displacement profoundly impacted people’s family relations with one brother against another. The residents she interviewed had called this place Kashmir and the establishment who acquired their land as no less than a Pharoah. Over all,the first round table conference was a fair exchange of ideas and experiences regarding between the people from various disciplines.The discussion reminds one of the significance of counter narratives to the state’s given image of the city ; and how it is essential to commemorate those who raised their voice against social injustice, helped unfold histories of violence faced by the indigenous communities and validate their cause. Hopefully, the next round table conference would be a discussion political, social or ecological issues and to obtain solutions to those crises.